Lazy weekends are meant to be savoured. We do deserve a day or two just lounging around in the comfort of our pyjamas with Otis Redding in the background as we sip a warm cup of tea while we leaf through the latest pretty prints we got from the post man. These are the moments that keep us sane. The times that we barely notice or make proper time for yet exactly what we need to make space for creativity and inspiration in our brains. It’s sort of the system-update for humans, if you may. So when you do get that chance to slow down, grab it. I know I do. And I know too that during these days, cooking can be quite a daunting task. Going out (which means dressing up decently and making yourself presentable to the public) is out of the question, so eating out is not an option. Food delivery? That kinda makes you feel desperate and, frankly, insulted, right? A grown woman shouldn’t be ordering fast food just because she can’t summon herself to put on proper pants. The thing is, you do not need an elaborate and complex dish to enjoy a good meal. 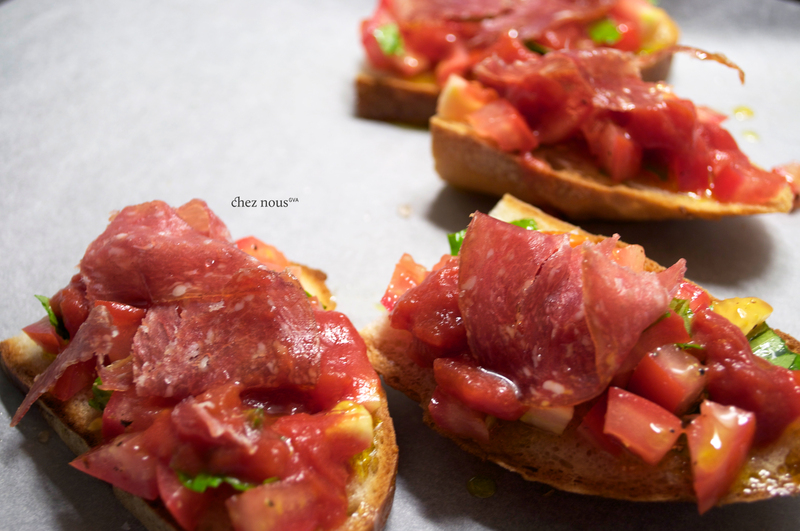 Bruschettas are my go-to lazy lunch or merienda option. 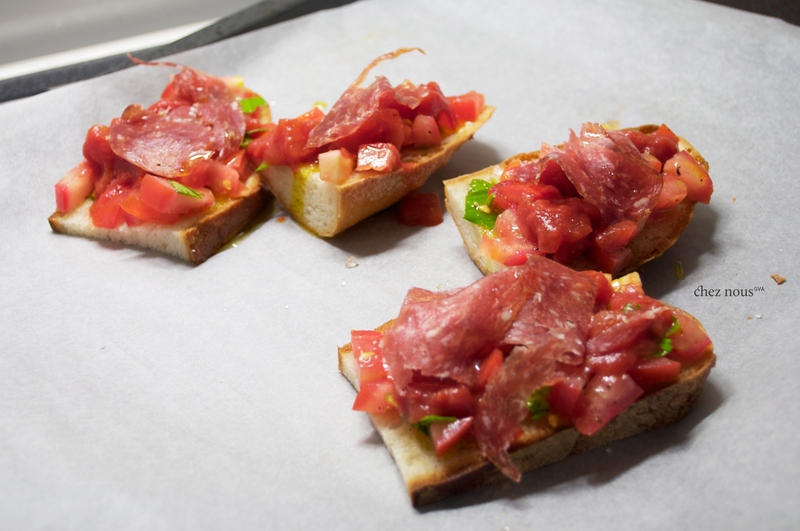 Simple, fresh, light and tasty. So don’t worry about getting out of your PJs today. 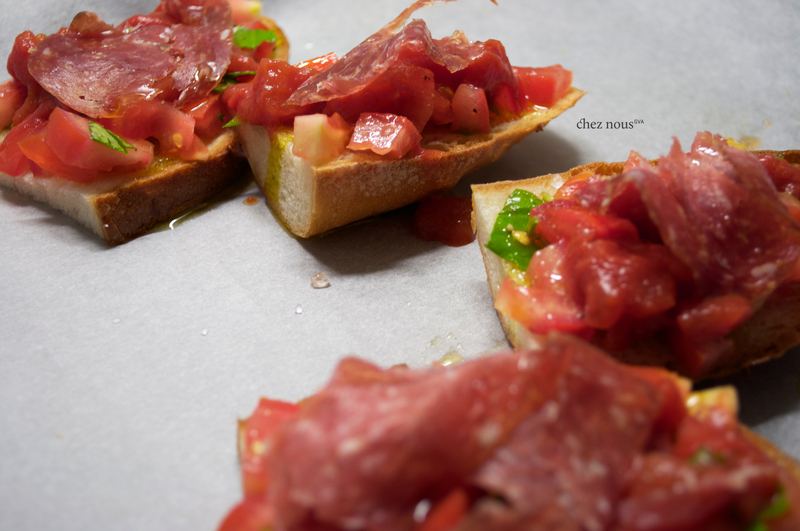 Just grab some bread, a couple of tomatoes, fresh basil leaves and whatever charcuterie you have in the fridge. Chop chop chop chop, slice, top, sprinkle sprinkle, drip and top. Tada! Your lunch is ready.